After P&O Cruises’ Ventura left Southampton for Barbados on Friday, Princess Cruises’ Crown Princess was due to leave 24 hours later. However, Princess Cruises decided to hold her back due to the impending arrival in the early hours of Monday morning of a storm called St Jude. We have a look at what other ships in Southampton did. Elsewhere, November usually marks the great peregrination of cruise ships from Europe back to the Caribbean for the winter, while January sees the annual Australasian departures, so we have a look at opportunities here. Finally, Hapag-Lloyd Cruises have announced four 4-night opportunities to cruise in the top-rated Europa 2 in the Baltic next June. As the storm, called St Jude after the patron saint of lost causes, whose day it was, made its way across the UK and the North Sea early Monday morning headed towards Europe, one ship got left behind. Princess Cruises’ 3,114-berth Crown Princess, which was scheduled to leave Southampton on Saturday, October 26, at 5 pm, twenty-four hours after sister company P&O Cruises’ 3,110-berth Ventura sailed, is still berthed at Southampton, although she did change berths to get better protection from the winds. Ventura sailed on Friday, October 25, and by Sunday was safely passing northern Spain en route to Ponta Delgada in the Azores. But Crown Princess was scheduled to sail for Le Havre, Vigo and Lisbon first. Both ships were scheduled for 14-night Transatlantic voyages, Ventura to Barbados and Crown Princess to Fort Lauderdale. 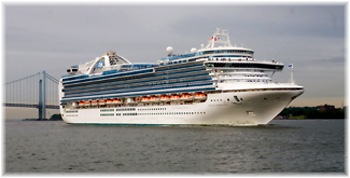 Crown Princess was also due to sail for Ponta Delgada but by way of the other three ports. Meanwhile, Royal Caribbean’s 3,634-berth Independence of the Sea, scheduled to depart Southampton on a 3-night Sampler cruise thirty minutes before the Crown Princess, managed to get away, leaving only the Crown Princess at dock. The Independence of the Seas spent Sunday in Le Havre, where the Crown Princess was supposed to have been, rather than the originally-scheduled port of Zeebrugge. Independence was still in Le Havre on Monday, and due back at Southampton in the early hours of Tuesday morning, by which time the Crown Princess should have sailed. Royal Caribbean’s 3,114-berth Adventure of the Seas also managed to get away from Southampton on schedule on Sunday for an 8-night cruise to France and Spain. On Monday morning, she was reported at anchor in 32-knot winds at Cherbourg, her intended port. From there, she is scheduled for Vigo, Gijon, Bilbao and Le Havre before returning to Southampton on Monday November 4. 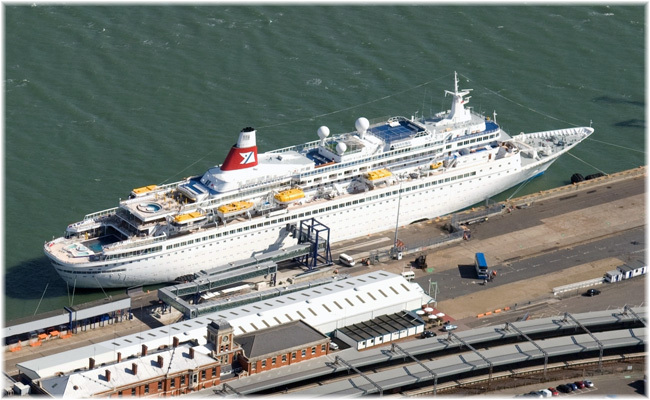 Inbound for Southampton from Lisbon and due at 4 am on Tuesday is Fred Olsen’s 1,747-berth Balmoral, which at midnight on Sunday was shown crossing the mouth of the Bay of Biscay, making just 1.5 knots in 30-knot winds, according to marinetraffic.com. By late morning she was back up to 15 knots. Her next cruise is a 13-night Agatha Christie cruise headed for the Canaries and due to depart late Tuesday evening, if she is on time returning to Southampton. On Sunday night, a surprise caller joined the Crown Princess at Southampton in Aida Cruises’ 2,194-berth AidaSol, which arrived nearly thirty-six hours early and berthed astern of the Crown Princess and further east along the Western Docks. She was not due until Tuesday morning but remained in port overnight and is apparently due to depart for Le Havre Monday evening, having reversed the call sequence at those two ports. AidaSol is on a 7-night cruise that left Hamburg on Saturday, the same day as Crown Princess was due to leave Southampton. Meanwhile, although four of them were riding out the storm at Dover on Monday morning, waiting until it was safe to enter port, ferries between the UK and France had continued to operate while the Crown Princess remained in Southampton. One wonders why the Crown Princess has been held back for two days when all the other ships have left port, until one remembers that this is also the ship that suffered a heeling accident back in July 2006, one that was put down to human error. After reaching Fort Lauderdale, the Crown Princess is due to sail around South America this winter. 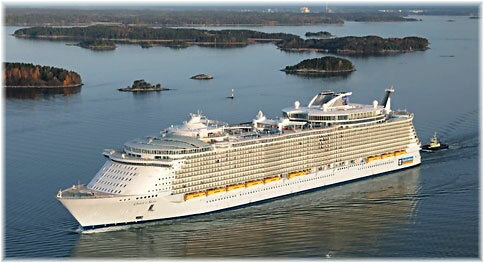 Next spring, she will become the largest Princess ship to sail regularly from Vancouver to Alaska. With a 118-foot beam, and a maximum width of 159 feet, she is too large to transit the present Panama Canal, where the maximum beam allowed is just under 106 feet. When Crown Princess does sail she will have to cancel at least two of the three calls that had been scheduled before Ponta Delgada, although she will also have to fuel somewhere as she does not have enough on board to reach Fort Lauderdale. According to some passengers on board, there also may not be enough food as she was supposed to take on further supplies in Spain. Crew changes that were due to be made in Lisbon may also be affected. The latest news however had her sailing from Southampton on Monday afternoon with an ETA Lisbon of 3:30 pm on Wednesday, October 30.This crossing is one of the fifteen October Transatlantic voyages listed by the Official Steamship Guide (see below). With the exception of Cunard Line’s 2,620-berth Queen Mary 2 running between Southampton and New York, ocean liners no longer ply the seas today. But there are still seasonal opportunities to take advantage of an old-style crossing as ships take their annual world voyages or reposition for the winter season. The Official Steamship Guide, the bible of American cruise followers, listed just five Transatlantic crossings in September, but this month the total has gone up to fifteen, of which only two are by the Queen Mary 2. Of the remaining thirteen, one is a passage from Fort Lauderdale to Rome (Civitavecchia) by the Maasdam, but the rest are all westbound voyages, by Norwegian, Princess, Holland America, MSC, Celebrity, Silversea, Seabourn and Royal Caribbean. Departure ports in Europe include Copenhagen, Southampton, Venice, Barcelona, Las Palmas, Harwich, Lisbon and Rome and arrival ports include Miami, Fort Lauderdale and Barbados. In November, however, the number of Transatlantic crossings more than doubles to thirty-one, of which only one is provided by the Queen Mary 2. And with the exception of the Queen Mary 2, all are westbound voyages by Celebrity, Carnival, Royal Caribbean, Holland America, Star Clippers, Silversea, Seabourn, Azamara, Paul Gauguin, Windstar, Oceania, Swan Hellenic, Regent, Sea Cloud and Hapag-Lloyd. Sailings are offered from Rome, Barcelona, Southampton, Malaga, Lisbon, Seville, Tenerife, Las Palmas and Funchal to the arrival ports of Miami, Fort Lauderdale, Tamps, New Orleans and Galveston, as well as St Thomas, St Maarten, La Guaira, Curacao and Barbados. December sees the number of crossings fall back to just five, one of which is by Queen Mary 2. What is clear, however, is that at this time of year, as cruise ships reposition to the warmth of the Caribbean for the winter, the capacity offered by other lines by far exceeds that offered by Cunard Line, especially in this age of mega cruise ships. 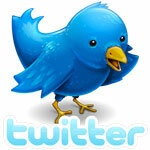 The main disadvantage is that most of these positioning voyages are much longer, ranging from 13 to 21 or more days. Meanwhile, the departure of the Astor from Civitavecchia on Tuesday, November 5, also marks the very beginning of the Down Under season. With the usual world cruise departures from Southampton taking place in January a number of liner-style voyages are also available to Australia. This season’s will include Cunard’s 2,014-berth Queen Victoria, sailing on January 2, 2,092-berth Queen Elizabeth on the 6th and Queen Mary 2 on the 10th, plus P&O Cruises’ 1,868-berth Aurora, sailing on January 4 and 2,064-berth Arcadia on the 10th. 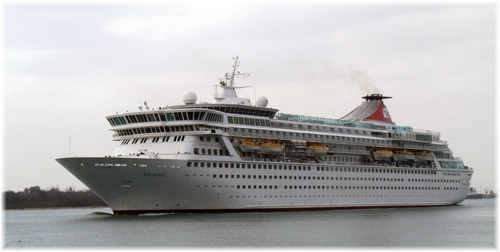 Fred Olsen Cruises’ 804-berth Black Watch also sails from Southampton on the 14th for Australia. In addition to the Cunard, P&O and Fred Olsen sailings that call on North America, there are sailings offered from North America by for instance Holland America Line, whose 1,380-berth Amsterdam departs Fort Lauderdale on January 4. Equally, the 450–berth Seabourn Sojourn leaves Los Angeles on the same day, followed by the 388-berth Silver Whisper on the 6th and 688-berth Pacific Princess on the 20th, all for Down Under. On World Cruises from Southampton, Fred Olsen’s Balmoral also leaves on January 5 and P&O’s 710-berth Adonia on January 7, but these travel via Singapore rather than Australia, while Holland America’s 1,404-berth Rotterdam sails from Southampton on the 9th, on a voyage out and back via Suez to Singapore and Indonesian ports. 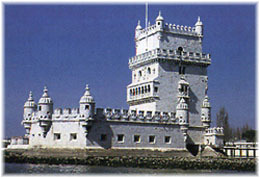 Taking place at the same time as the North Atlantic voyages, the annual peregrination to South America is already under way, with several Costa, MSC, Pullmantur, Royal Caribbean and Iberocruceros ships leaving the Mediterranean for the winter in Brazil or Argentina, once of course a busy immigration route. 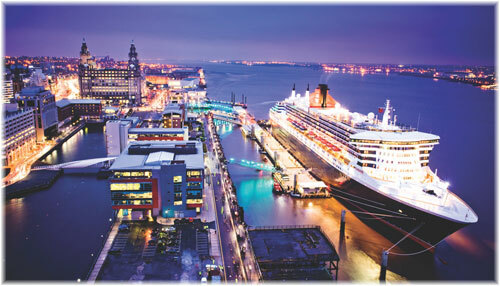 Oceania and Regent Seven Seas also offer voyages from Barcelona to Brazil at this time of year. What will be slightly different next year is that Royal Caribbean has chosen to brand its voyages, calling them Ocean Voyages. The line has also decided to spice up some of its Transatlantic crossings by including drinks packages, new on board programming and special shore excursions. This will take place on eleven ships in 2014, including the 5,408-berth Oasis of the Seas, on a 12-night voyage Fort Lauderdale to Barcelona, departing September 1, and 4,180-berth Quantum of the Seas, on her 8-night delivery voyage from Southampton to Bayonne NJ on November 4, 2014. Every crossing will also include a Black and White party for those who like costume galas. For those wishing to sample the world’s newest top-rated cruise ship, Hapag-Lloyd Cruises have announced four 4-night short cruises on board their 516-berth Europa 2 in the Baltic next June. These sampler cruises include sailings from Hamburg to Kiel and vice-versa, as well as two round trips from Kiel. On June 7, Europa 2 will sail from Hamburg to Kiel via Oslo and Copenhagen, on June 11 and 15 on two different Baltic itineraries round trip from Kiel and on June 19 from Kiel back to Hamburg via Copenhagen, Gothenburg and the Kiel Canal. Fares for these sampler voyages start at £1,560 or €1900 per person cruise-only a guaranteed verandah stateroom.